* FATA – Federally Administered Tribal Areas in North West Pakistan on the border with Afghanistan stretches on 27,200 square km and has a population of about 6,000,000 (09/2008). 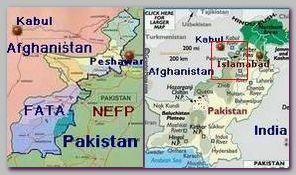 The administrative area is formed from seven districts stretching from North to South: Bajaur, Mohammand, Khyber, Orkazai, Korram, North Waziristan and South Waziristan. The fact that the region is “Administered” suggests that the Pakistani regime came to the conclusion that the local inhabitants are not capable for self administration. FATA is an extremely undeveloped region without basic infrastructure. The train is mountainous and very steep and the weather during the winter extremely harsh. Almost all the population is Pashtu divided and organized according to tribal lines. Like all mountain people they are excellent trackers and warriors. The Pashtu are known as very hostile toward strangers, sticking to their long lasting traditions, resent any foreign authority and are devoted Muslims. For the Pashtu tribes war is not a necessity but a way of life. If there is no foreign enemy to fight such as Russians, Americans, NATO-ISAF or the Pakistani army, they are fighting each other with the same enthusiasm. FATA is in the heartland of the Pashtu Tribes belt of about 400,000 km which stretches from North West Pakistan known as NWFP – North-West Frontier Provinces to South East Afghanistan. During the war against the Soviet Union in Afghanistan, in the years 1979-89, FA.TA became the front base of operation for USA, Pakistan and Arab volunteers, as well as pro Afghan insurgents– the Mujahidin (Holly Warriors) and the relations between the Pashtu tribes on both sides of the Afghan-Pakistani border were consolidated even more. It is from the Pashtu population that the Taliban emerged in the mid 80s’. After operation Absolute Justice in Afghanistan in 12/2001 it was most natural that the remnants of the Taliban regime and Al Qaeda found refuge in the FA.TA regions. Today (09/2008) FA.TA is once again the front base of operation for Islamic insurgence in Afghanistan based on Pashtu tribes. Al Qaeda and Tehrik-e-Taleban (the Taliban’s Way), an alliance of over 30 pro Taliban groups in Pakistan, are running training camps just as in the days of the war against the Russians 20 years ago. Like during all the history of the region the PAKISTANI ARMY and regime are facing extreme difficulties to control, somehow, the region and the border with Afghanistan. FA.TA became the safe haven and the epicenter of the war on terror both in Pakistan and Afghanistan fully ruled by local tribe leaders and warlords. Indeed, in summer 2008, USA president George W Bush has authorized USA military raids of special ground units against militants inside Pakistan FA.TA area without prior approval from Islamabad (see – Bush 2008 approval ).